Right now we are waiting for new Peter Heard Limited Edition Prints to arrive at the gallery. In the meantime, here is a selection of the artist's archived art work which has featured at Red Rag Art Gallery. If you wish to register to receive updates and alerts when new art work from Peter Heard arrives select this link. Peter Heard was born in London in 1939. A Chartered Civil Engineer by profession, Peter began painting in the early 1970s. Peter is an entirely self-taught artist known for his graphic compositions. His paintings and prints display bright use of colour, minute attention to detail, fabulous blue skies and speckless finish. Peter Heard is a most prolific painter of lighthouses. A chance holiday on the lighthouse-strewn barrier islands of North Carolina's Outer Banks proved to be a life-changing experience for the engineer-artist. Following this several dozen British, American, Canadian and Irish lighthouse paintings were painted. 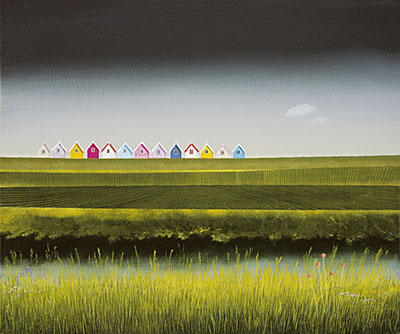 Red Rag Gallery is delighted to be able to offer Peter Heard paintings as Limited Edition Prints. All Peter Heard signed limited edition prints from Red Rag Art Gallery have been reviewed by the artist. This guarantees that all prints offered by Red Rag satisfy the high quality and fine art standards set by Peter Heard for prints. Each limited edition print series from the Red Rag British Art Gallery is available for immediate delivery and can be shipped worldwide.